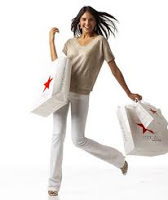 It's becoming a recurring monthly theme, but I'm not complaining about another Macy's Super Saturday Sale. Every department is discounted up to 50% OFF. Bonus: Spend $99 they will take an extra 10-15% OFF and ship to your house for FREE. In my opinion the best part of the sale is the extra 25% OFF all clearance. That's not to say you have to go with the discounted discounted stuff. There's incredible sales on clothing, jewelry, home items, accessories, and more.